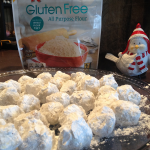 Gifts for Coffee Lovers – Get Cooking! A small (but passionate) team of coffee lovers and coffee roasters from Columbia have started a coffee subscription service called White Tale Coffee and I’d love to tell you why this is some of the best news you’ll hear all year. 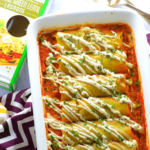 But first, I have a confession to make – I’ve been working on this one review for weeks. Why? Well, I’m struggling to figure out a way to sum up 4 separate, equally outstanding coffees while spotlighting a fun, exciting new coffee subscription service. 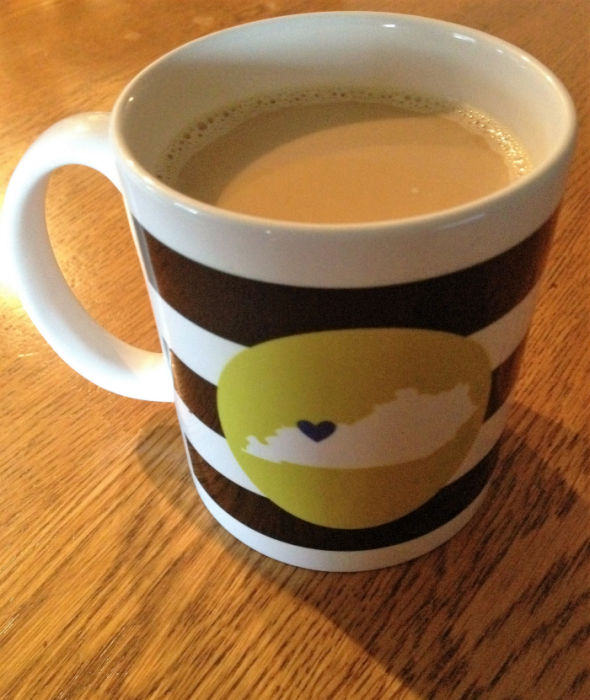 That’s a lot to ask from one coffee-chugging, baseball-addicted, crazy cat lady in Kentucky. But she’s sure going to give it a try. White Tale Coffee is committed to more than just providing fellow coffee lovers with exceptional cups of coffee each and every morning. They’re committed to telling the story of the farmers who grew the coffee beans, the communities that are sustained, and the journey that beans make from coffee farm to coffee cup. White Tale takes this mission very seriously and seem to deem it an honor to be involved in the process. It’s that simple. I don’t know about you, but I like – I mean I really, really like simple. Of course, I don’t like simple as much as I love coffee – few things achieve that status. 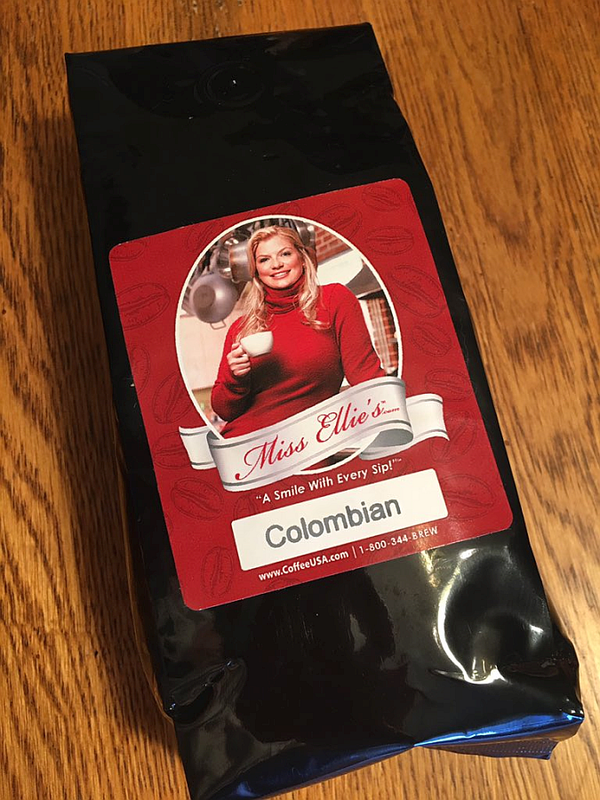 As I’ve said in other coffee reviews on Get Cooking, we buy A LOT of different coffee in my family – different roasts, different roasters, different varieties. We’re passionate about coffee and feel that limiting ourselves to one or two favorites would be like limiting ourselves to one or two favorite vegetables. The more roasters you experience, the more your enjoyment of coffee and love for coffee will grow. Coffee Subscription Services, such as White Tale’s, allow you to experience SO many different wonderful coffees from all over the world…. 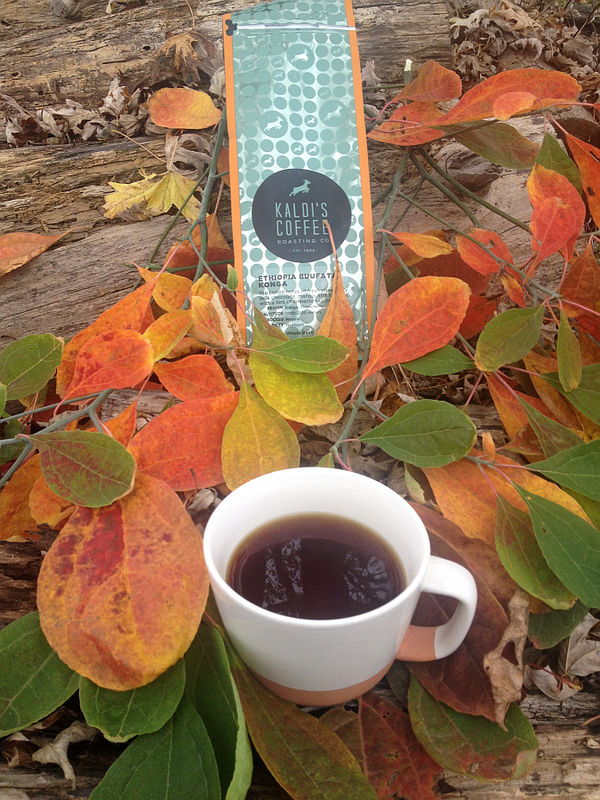 it’s a beautiful time to be a coffee lover, make no mistake about that. 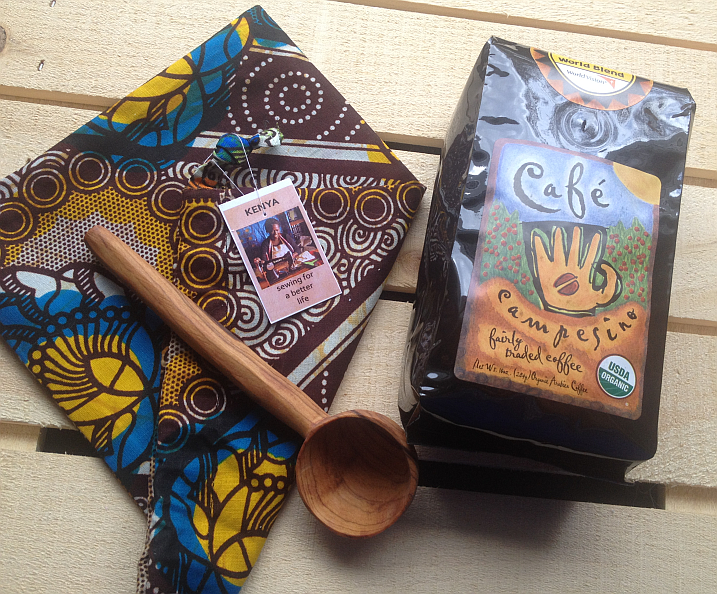 Chiuta (Country: Congo) – There was a sweetness to this particular coffee with hints of berries. 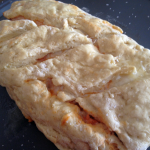 It was amazing with breakfast and I found it to be a necessity with desserts. Laderas (Country: Colombia) – Bold and memorable. It’s the type of coffee you remember, you know? There was an obvious caramel flavor with a hint of tangerine. 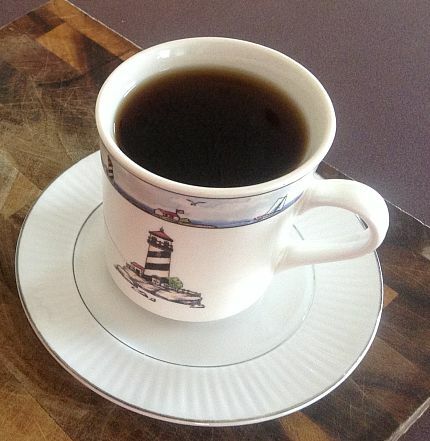 When trying a new coffee, I recommend different methods because each one often “uncovers” a different flavor. The Pour Over method uncovered the tangerine flavor that the AeroPress bypassed. There’ve been other times, of course, when the AeroPress brought out flavors missed by the pour over or immersion. 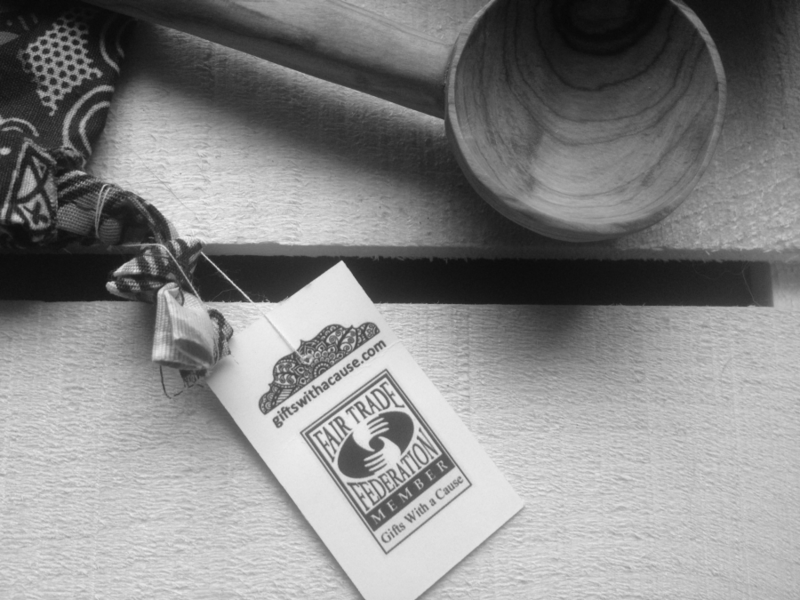 Lava Quetzal (Country: Guatemala) – A beautiful dark roast coffee that is easily associated with Guatemalan coffee. With notes of caramel, cedar, and raisin, the flavors are mind-blowing. Each of the coffees I tasted were outstanding, but this one kind of stands out to me. The complexity of the flavors fascinated me with each and every sip. Don’t get me wrong, I plan to order and re-order each one, but this one has a special place simply because it was quite unlike any coffee I’ve ever tasted. Kivu (Country: Rwanda) – The coffee identifies itself as having notes of cocoa, sugar cane, and hibiscus and it is spot on. There is a distinct sweetness and a tiny hint of a floral flavor in the background. However, my tastebuds kept telling me the flavor was more of a marigold than hibiscus – but, either way, it is phenomenal and (like the Lava Quetzal) absolutely fascinating. This coffee also stands out to me and left a wonderful impression. I can’t wait to order another bag! Basically, I don’t think you could possibly go wrong with any coffee you order from White Tale because their commitment to providing the best coffee possible is obvious with each cup. 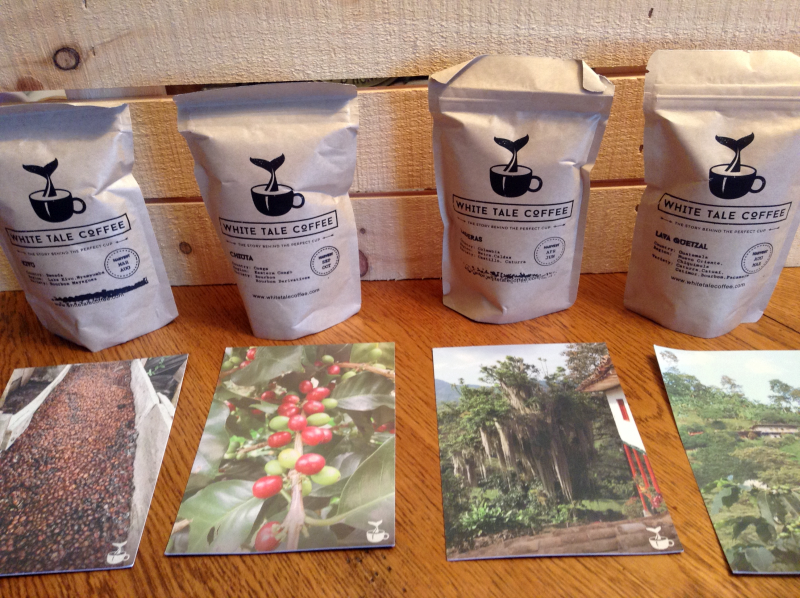 Whether you head over to White Tale Coffee to sign up for one of their coffee subscription services, order a sample pack, or choose a bag of one of their exceptional coffees – you will not be disappointed. 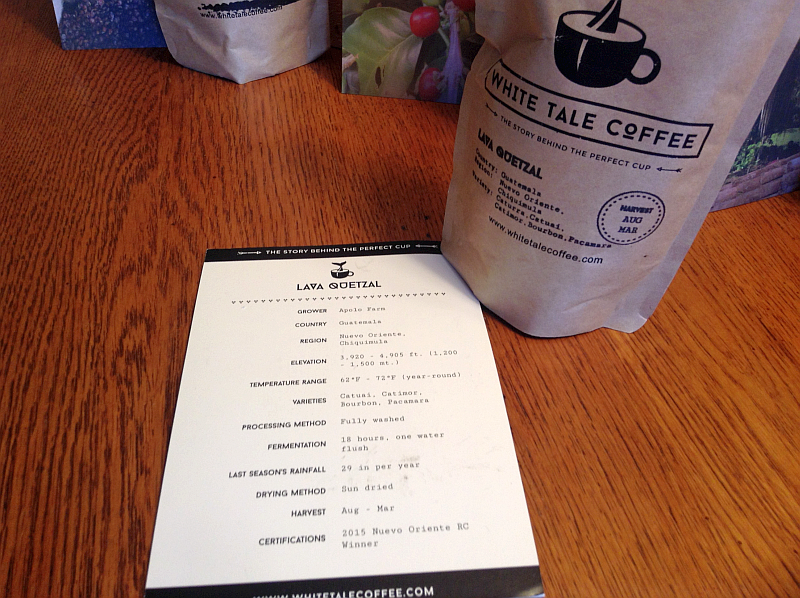 I can’t say enough wonderful things about White Tale Coffee, so I will simply end on this note: White Tale Coffee isn’t just telling stories about coffee… they’re rewriting the book on great coffee. 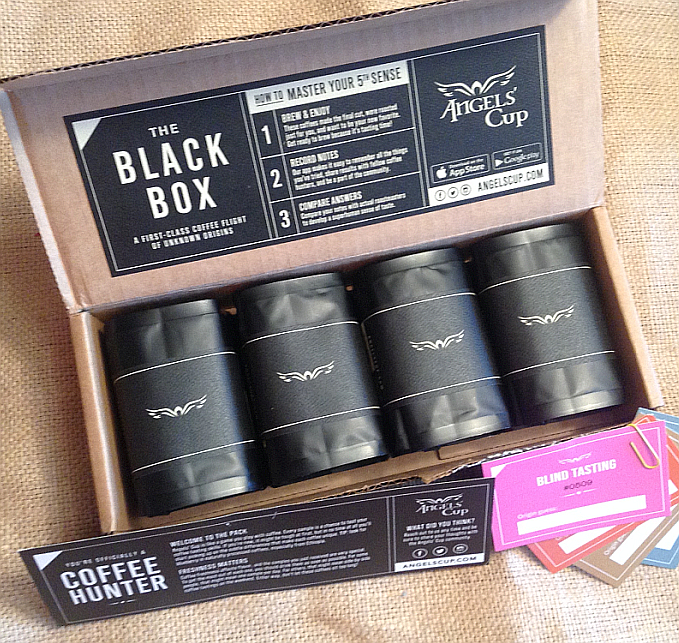 Angels’ Cup Black BoxIf you love coffee, this is something that’s going to rock your world. 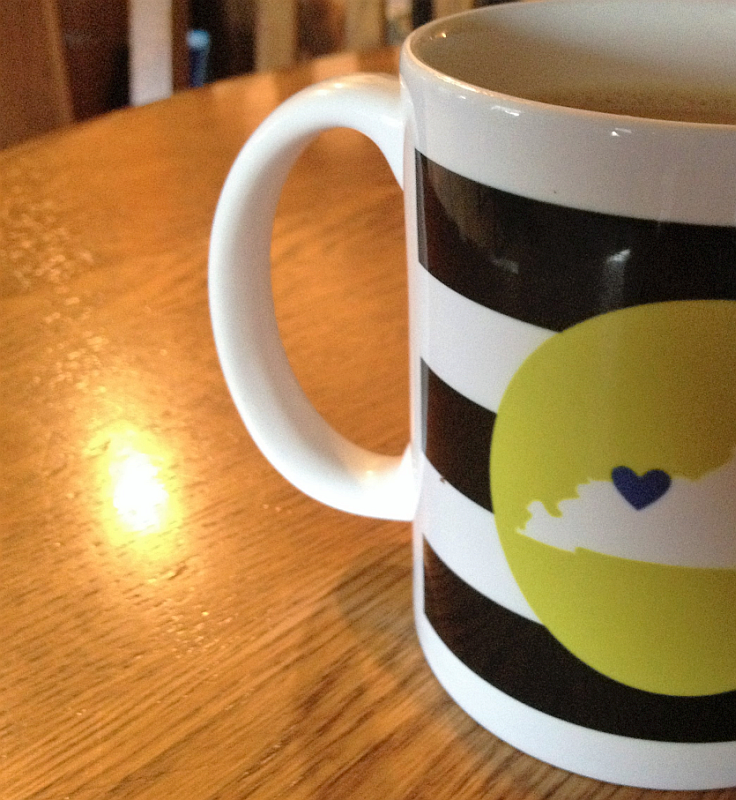 Angels’ Cup is an Online Coffee Subscription Service that’s a raging success. 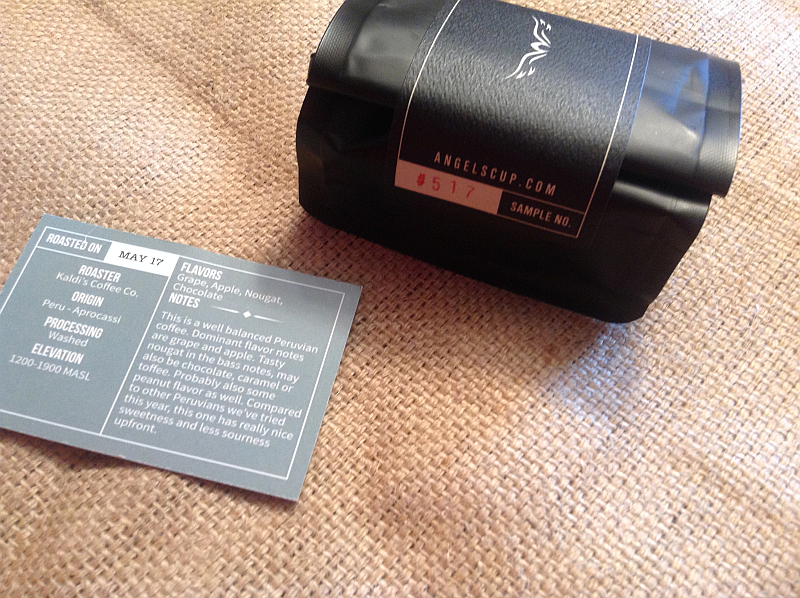 I was recently sent four delicious coffees in an Angels’ Cup Box in exchange for telling you about their highly creative, fun, and downright delicious subscription program and app. In a stroke of genius, Angels’ Cup has incorporated humanity’s passion for apps and socialization WITH its passion for coffee. Kind of makes you wonder how no one else has thought of this, doesn’t it? 1. Join the hunt. Try up to 208 different single-origin coffees this year. Plans starting at only $9.99/month. Every coffee is excellent, one might be your new favorite! 2. Blind taste test. Sample coffee without bias and decide for yourself what you like. A number on the bag will help you identify the coffee after you’ve tried it. Coffee Subscription Services pretty much make Christmas come once a week or once a month. 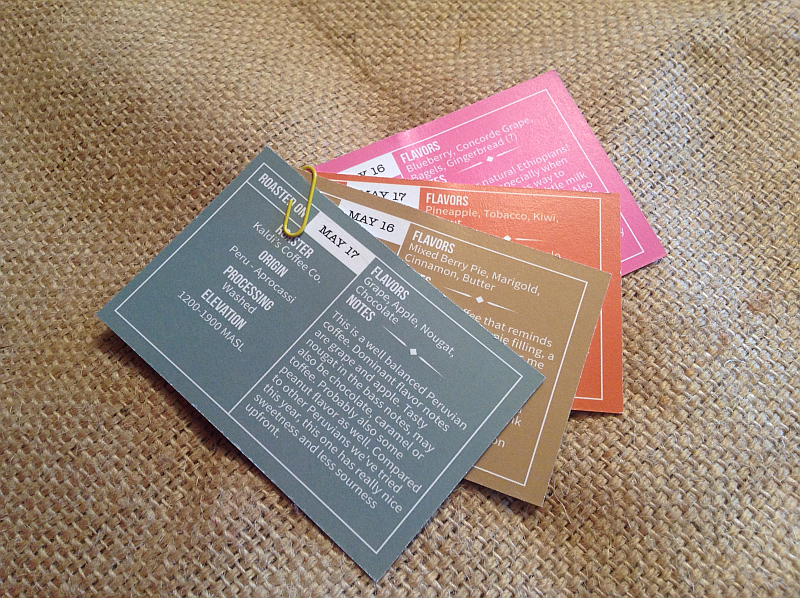 Each week or month you receive exciting new coffees to sample. Each coffee is a wonderful surprise – just like opening a present on Christmas morning. You don’t know exactly what it’ll be, but you know you’re going to love it. Opening an Angels’ Cup box, for a coffee lover, creates a level of excitement that’s on par with a ten year old sitting under the Christmas tree. It’s FUN. They say you shouldn’t “play” with your food… but what do they know? Recording your tasting notes and comparing them with “experts” is unspeakably cool. Sometimes mine match, sometimes not so much. But that’s okay, experts can’t be perfect, right? I mean, it couldn’t possibly be me? In a world filled with news that seldom falls under the heading “okay” let alone “good,” and with bills, work, stress, responsibilities, and let’s not even get into politics… a little fun isn’t just a welcomed escape, it might just be a sanity-preserver. You Call the Shots. You choose the size of box and samples you want as well as how often you want them. You can also choose whole bean, coarse grind, or fine grind. Click here for the different choices. It’s All About the Coffee. When all’s said and done, the stars of the show are the coffee beans that come each week/month. Experiencing different coffee is a beautiful thing. When I hear someone say they always buy a certain type of coffee, I always want to point out that that’d be the same as buying the same thing for dinner every single night. I never point this out because I guess part of me is afraid they do just that! The third one above is my personal favorite thing about Angels’ Cup. In our home, we take our coffee seriously. While we have a select number of favorite coffees and favorite coffee roasters, we absolutely LOVE to try new coffees as well as new coffee roasters. It’s one of our greatest joys in life – right up there with fried catfish and baseball. Our Angels’ Cup box included two different samples from one of our favorite roasters, Kaldi’s Coffee, a sample from Peixoto Coffee, and a sample from Tinker Coffee. Not only were we reminded just how wonderful the two from Kaldi’s are, we’ve now been introduced to two other outstanding coffee roasters and are in the process of choosing what we want to order from each. The four samples included in this box were each extraordinary. I’ll be writing coffee reviews for each one in the coming weeks. Angels’ Cup is the perfect way to open up a whole wide world of coffees and roasters. I absolutely loved re-experiencing old favorites and making new favorites along the way. Angels’ Cup is an exciting coffee subscription service and I hope you’ll give them a chance to rock your world. I promise, they’ll do just that. Delicious Cup of Coffee from Peixoto Coffee. 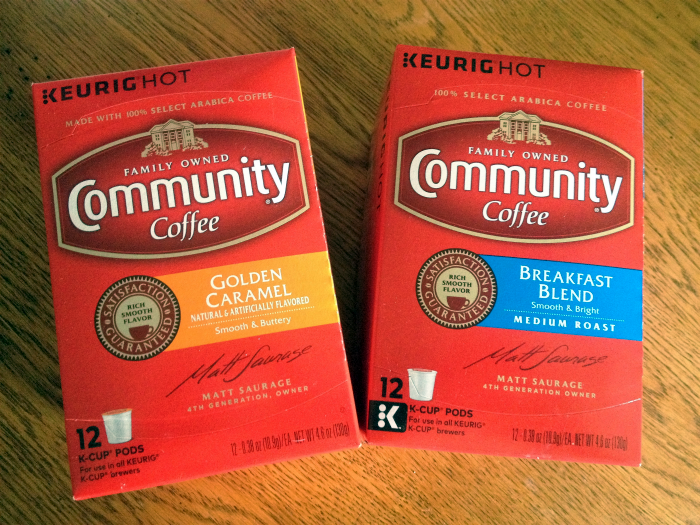 Add Community Coffee to the list of great names in coffee who now offer K-Cup Pods. I was recently sent the Golden Caramel and Breakfast Blend K-Cup Pods to try and I loved them both. I honestly expected to prefer the Golden Caramel, because I have a bit of a sweet tooth (and when I say “a bit of a..” I actually mean a mouthful). However, I can honestly say that I’m just as wild about the Breakfast Blend. The Breakfast Blend is very well named, because it goes perfectly with eggs, bacon, and – YUM! – pancakes and syrup. It gives you a delicious, rich wake up call without any bitterness. It’s just a beautiful cup of coffee. The Golden Caramel is, as you’d expect, decadent! This is my “go to” when I need a little pick me up around 2:00. For whatever reasons, it’s like clockwork in my home office – 2:00 brings what I call the “draggies.” My computer typing slows down, my brain all but shuts off, and I find myself gazing out the window more and looking at my computer less. It’s right around this time that my brain begins fantasizing about how great a nap on the couch would feel. The draggies always bring an ultimatum, too – nap, shower, or coffee. As you’d imagine, the third choice always wins. K-Cups were custom made for the draggies! Some coffee snobs look down their noses at K-Cups – they reason that if their coffee experience doesn’t begin and end with beans in a grinder, it isn’t a coffee experience at all. God love them, I appreciate their earnestness and passion for coffee but, if they used good quality K-Cup pods, like Community Coffee, they’d soften their stance. They’d also enjoy the heck out of the cups of coffee these K-Cups provide. Community Coffee has been giving back to our military troops for over a decade with their Military Match Program. Like you, I respect the brave men and women in our military with all that’s within me and I don’t just applaud companies like Community Coffee that give back, I STAND and applaud loudly! Community Coffee Company’s Military Match program has helped Americans across the country send more than 4.2 million cups of coffee to active-duty personnel worldwide. When customers purchase 4 bags or boxes of Community® coffee online, the company doubles each order, donates a Signature Military Mug and sends them to any APO/FPO address provided! BUY 4 – Buy your favorite Military Match Set of four 12 oz., 16 oz., or Single-Serve 18 ct. coffees. GET 4 FREE – We’ll match your purchase with an additional four items, and send all eight items to the APO/FPO or military base address you provide. A FREE MUG! 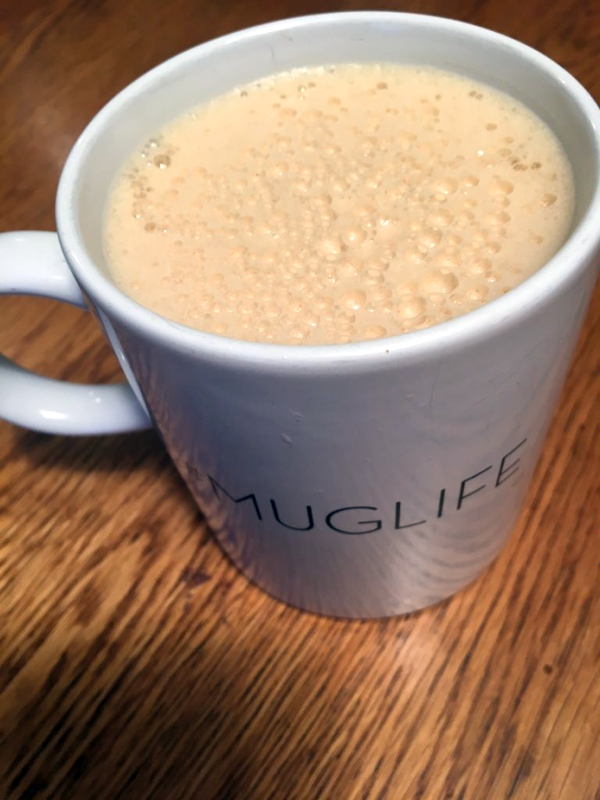 – We’ll even include our Signature Military Mug with your shipment. Please read more about Community Coffee’ s Military Match Program and jump right in, with coffee cup in hand! 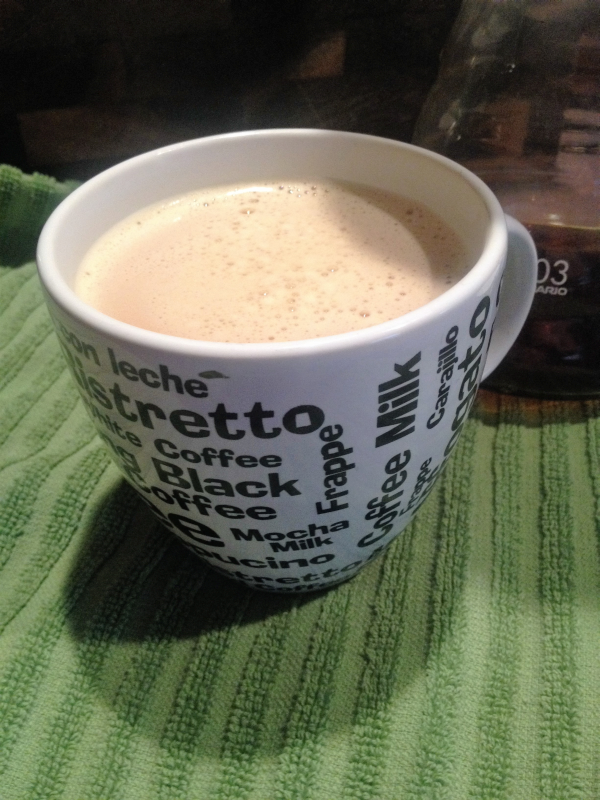 Community Coffee’s Golden Caramel with a Little Creamer… HEAVENLY! 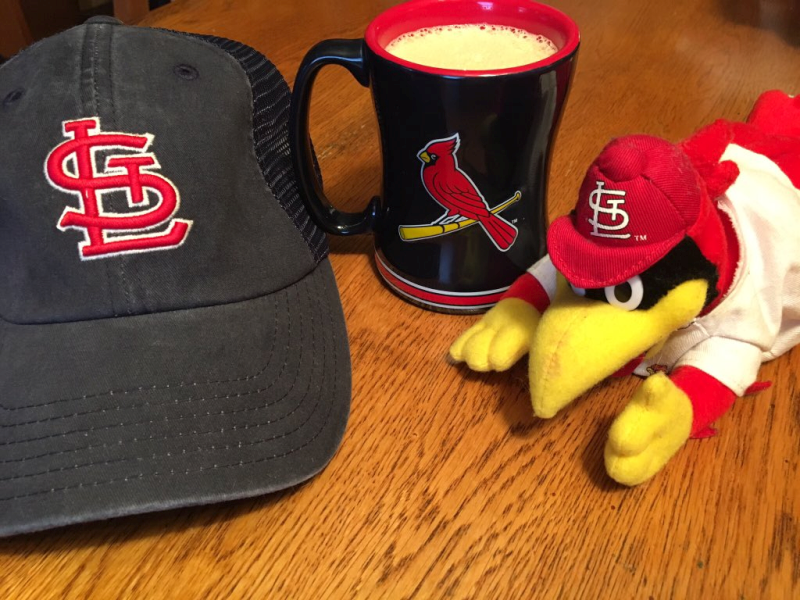 I suppose in a lot of “normal” households, coffee is something that’s enjoyed in the morning, then not even thought about until the following morning. But normal isn’t a frequent guest in our home (he showed up once, looked dazed, then left – we haven’t heard from him since). We pretty much celebrate the beauty of coffee from the start of our day right up until the end. However, since the end involves something else we celebrate – sleep – we always have great decaf coffee on hand. 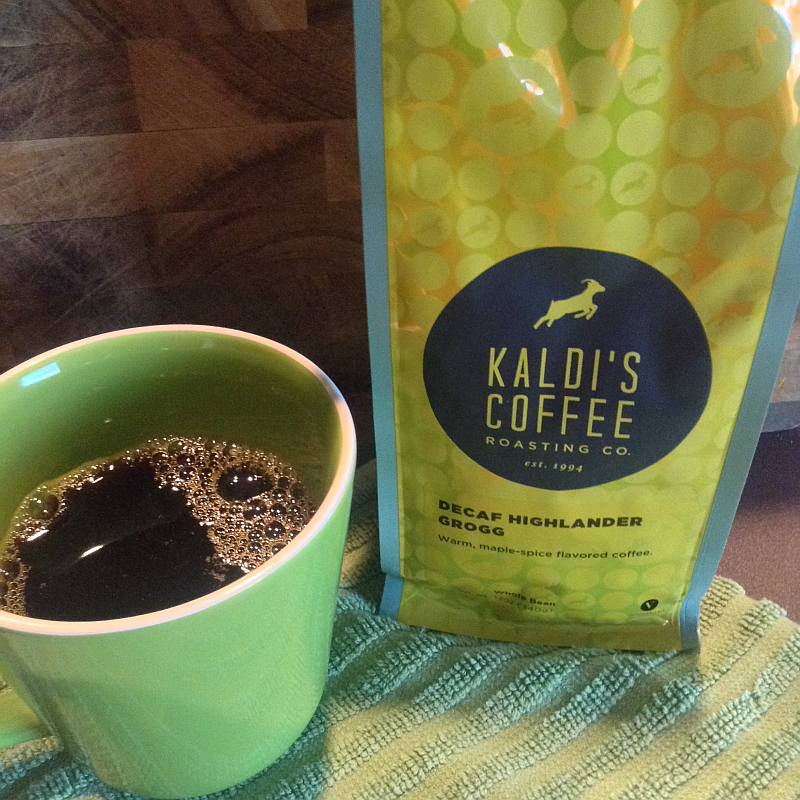 While I’d have a tough time naming my absolute #1 favorite coffee with caffeine, I can easily tell you the best decaf coffee you can find online or off: Decaf Highlander Grogg from Kaldi’s Coffee. 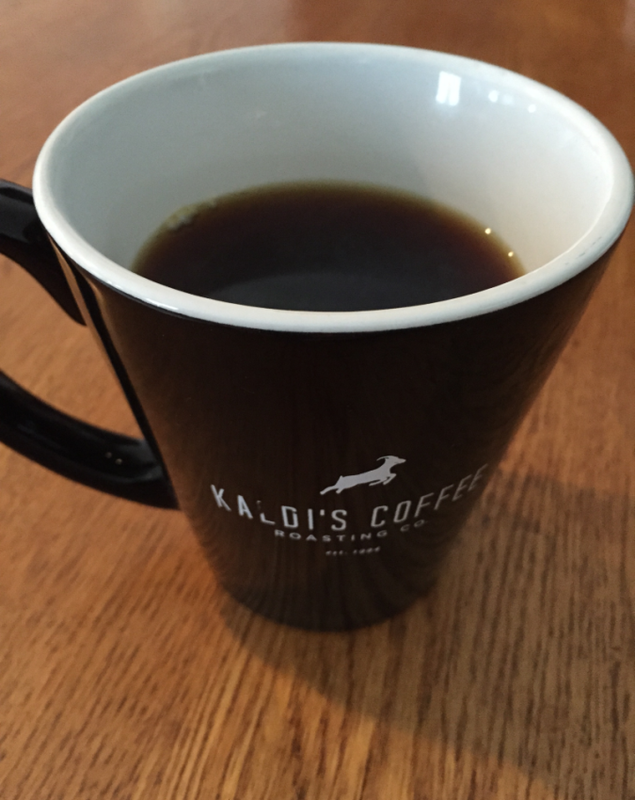 If you’ve read any of my coffee reviews on the food blog, the name Kaldi’s won’t be new to you. It’s truly some of the best coffee you can buy. 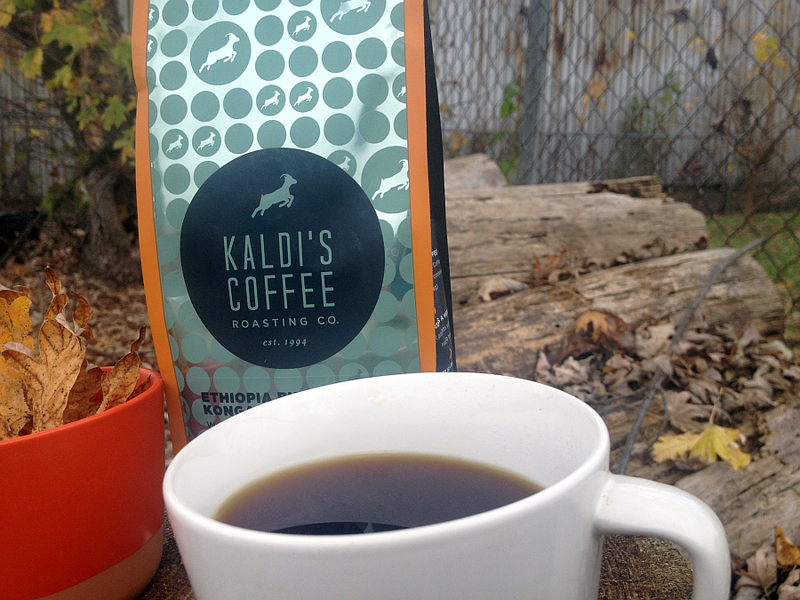 When I DO attempt to name my favorite overall coffee, in fact, a few of Kaldi’s coffees are the first ones out of my mouth: Birds & Bees has, for years, been the first coffee to roll off my tongue and it’s usually followed by other Kaldi’s coffees such as Cafe Kaldi, Highlander Grogg, and a new obsession: Ethiopia Buufata Konga. 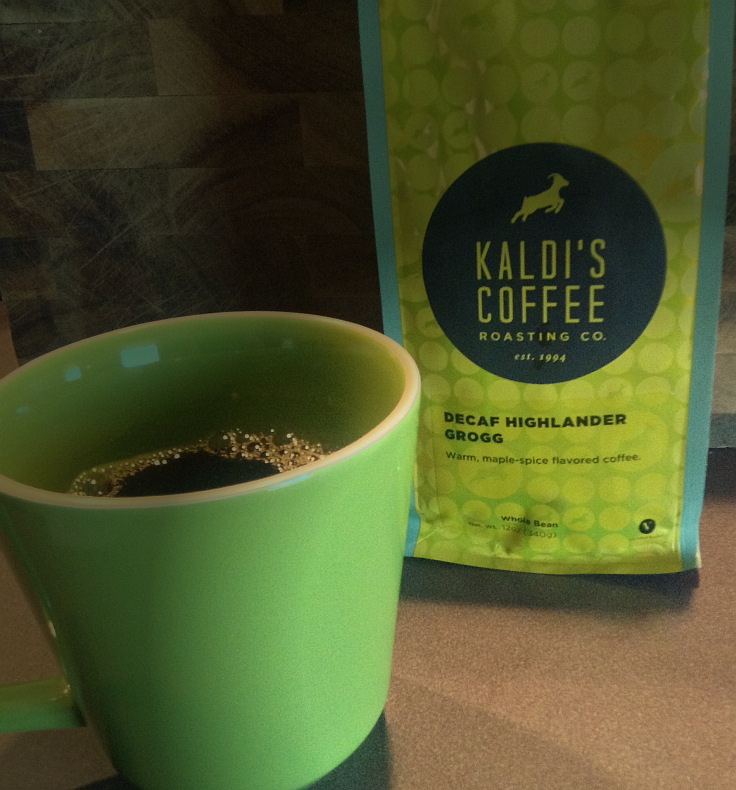 Whatever history you have with decaf coffee, Kaldi’s Decaf Highlander Grogg will change everything you ever thought you knew about decaf coffee. Decaf Highlander Grogg tastes just like a great coffee with caffeine. In fact, the first time my husband brewed some for our youngest daughter and me, I thought he’d made a mistake. Don’t tell him, but I even checked the bag. 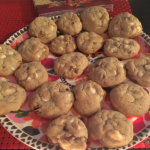 The subtle maple-spice flavor in the background is the secret behind its magic. It’s simply fantastic. 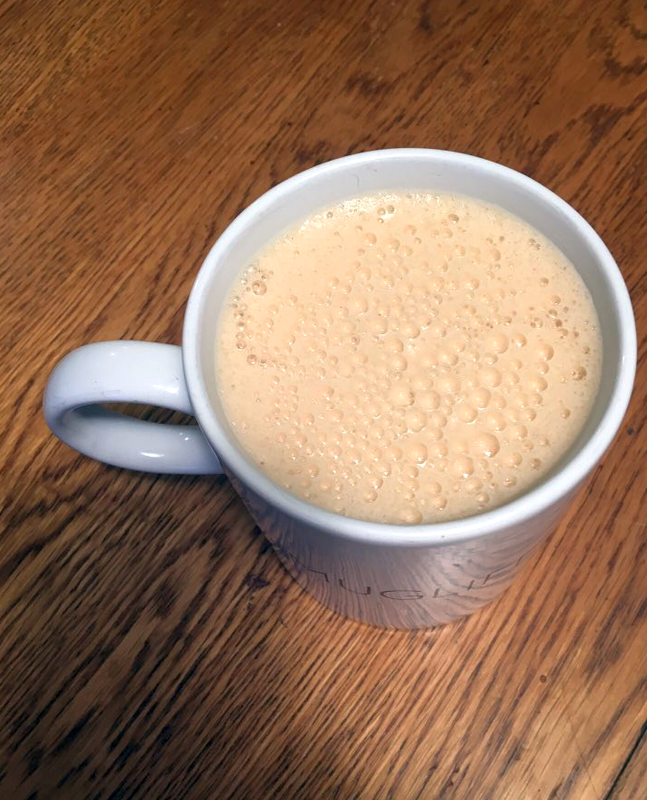 We normally enjoy Decaf Highlander Grogg made with a pour over, but it’s just as perfect made with an Aeorbie Aeropress or even in a coffee machine. The flavor always shows up and, trust me, it’s out of this world. 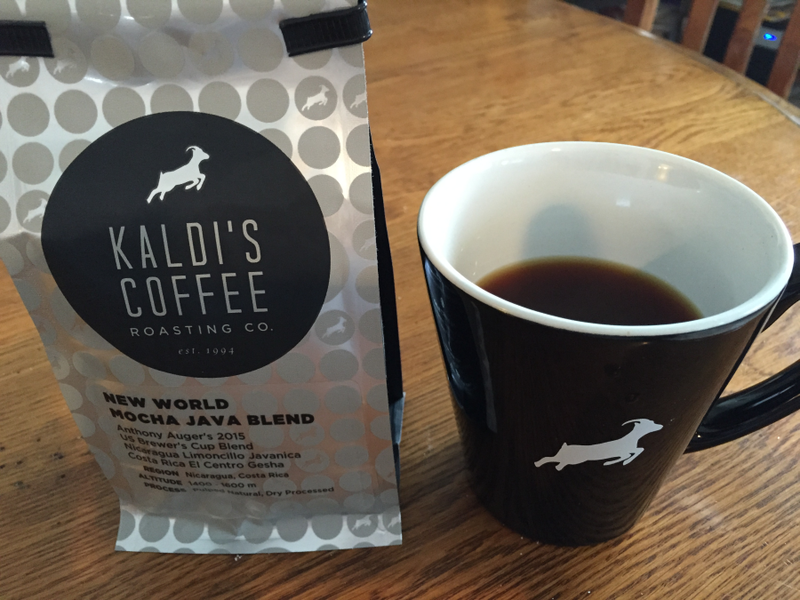 The next time you want to order coffee online, you really have to try Kaldi’s Coffee. 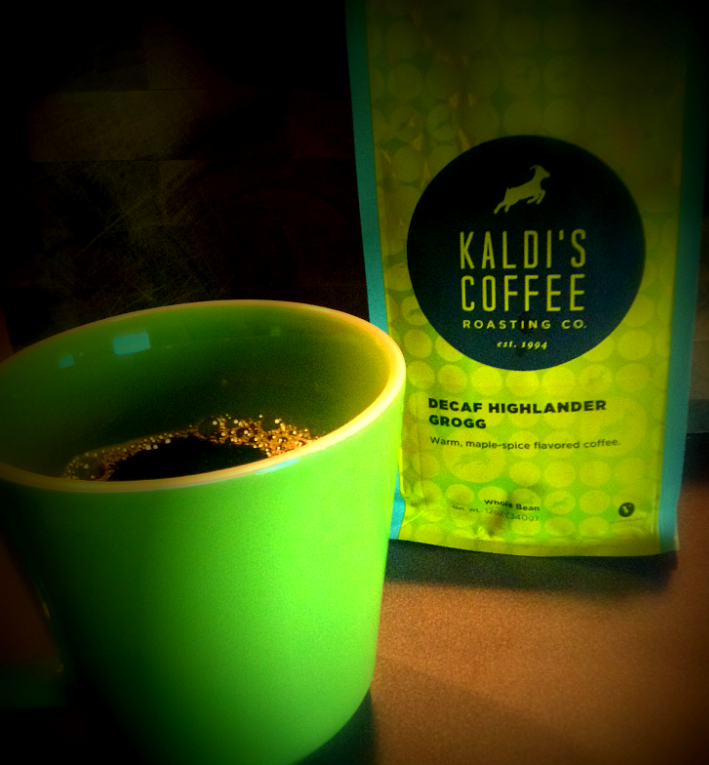 If you’re looking for the best decaf coffee you can buy online, Kaldi’s Decaf Highlander Grogg is your guy. Boom! That was the sound of my taste buds exploding when I brewed some of the best coffee beans I’d ever been lucky enough to find. 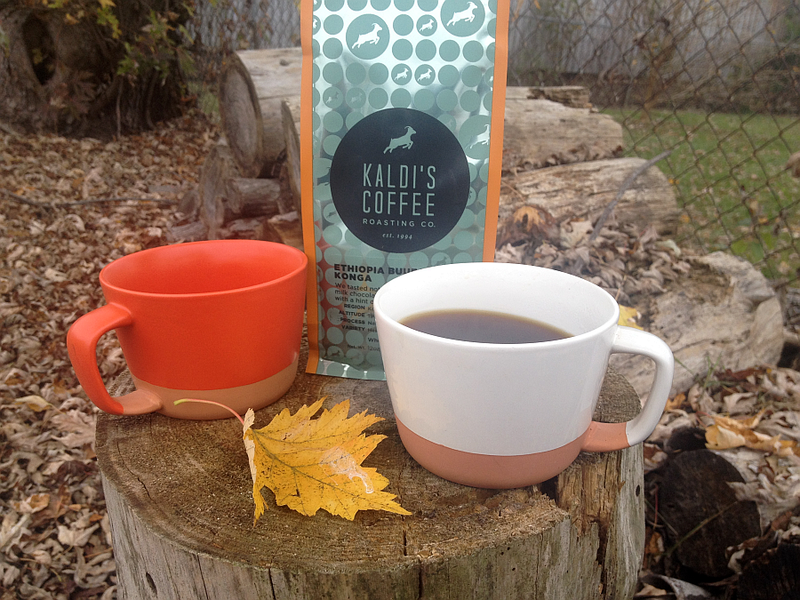 The uncommonly friendly coffee fanatics at Kaldi’s coffee sent us a bag of the exact same beans that @Tony Auger was using in the 2015 Brewers Cup Competition and we couldn’t wait to try them out the very next morning. Why put off a good thing, right? 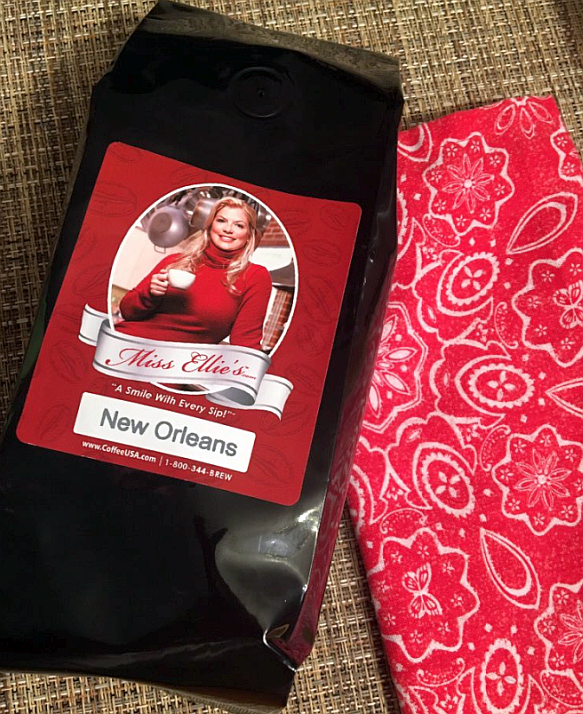 This blend is a combination of Nicaragua Limoncillo Javanica and Costa Rica El Centro Gesha. 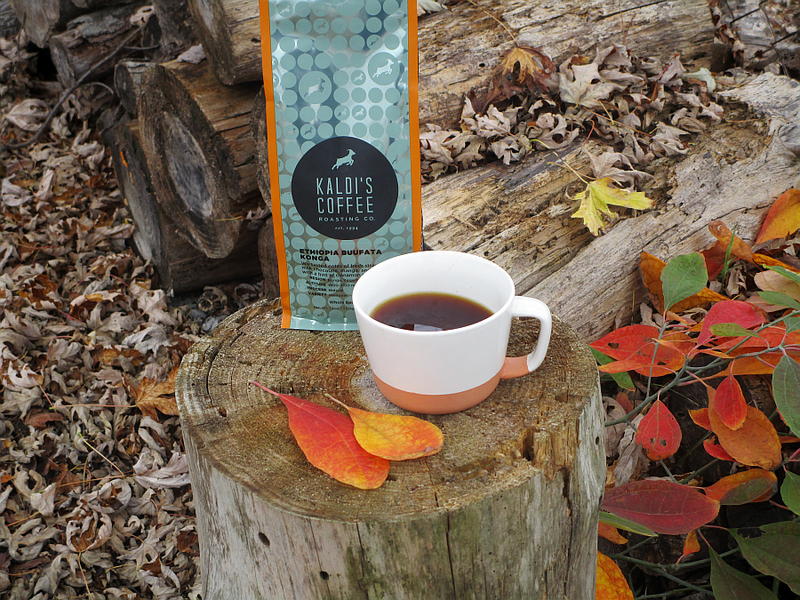 Read more about the story behind the blend on Kaldi’s Blog. We first tried them in a Hario V6o as a pourover at 200* and the taste was outstanding! Then we brewed them at 185* in an AeroPress and the flavor exploded! We’ve found that different methods extract different flavors from different beans and, in this case, the beans produce nothing but excellent coffee time after time… the AeroPress method simply produces a whole new boldness that is dang agreeable. So no matter what brew method you use to make handcrafted coffee these beans will blow your mind. 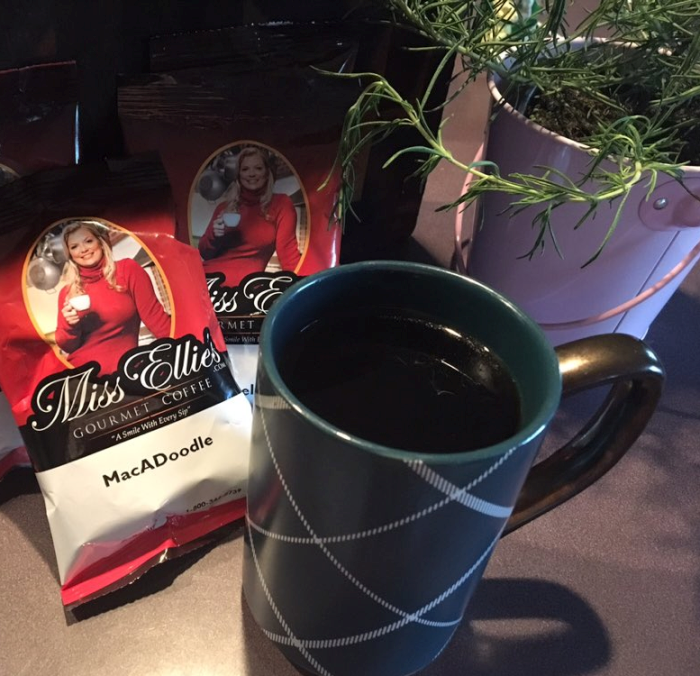 When I took my first sip this morning (the first of many, I might add), the first thought to spring to mind was this: These are the perfect beans to have on hand when you want to impress someone! 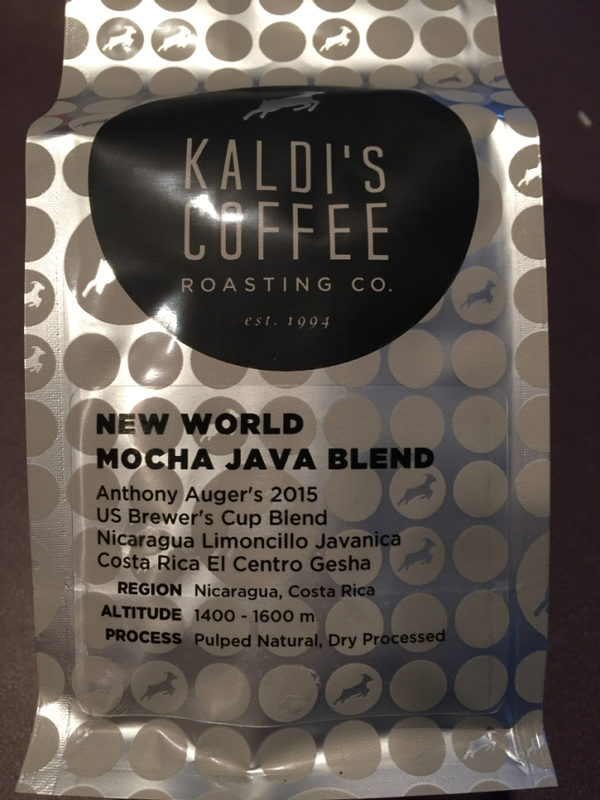 Whether it’s a fellow coffee lover (who only thinks they’ve tasted the best coffee known to any coffee nerd) or an in-law that you need to score extra points with – Kaldi’s New World Mocha Java Blend will make you a legend. But you have to hurry over to the website of the best dang coffee roasters on the planet because there’s only so many of these beans to spread around like coffee love before they’re gone! Good luck to David, Tyler and Tony as they compete in the 2015 United States Barista and Brewer’s Competition. This One Cup Project Fair Trade Coffee Review is just a little lengthy, so be sure to continue reading after each picture! Over the years, I’ve been blessed to receive a lot of wonderful food, drinks, cookbooks, pans, and kitchen gadgets to review on Get Cooking. I was recently sent a Fair-Trade Coffee Gift Set from the One Cup Project (a beautiful organization that works with World Vision) and it had an immediate effect on me. In fact, the effect hasn’t left and I don’t believe it ever will. First a little bit about World Vision. This charitable organization (no doubt you’ve heard of them) doesn’t just “want’ to help save the world, they’re rolling up their sleeves and having at it. And by save the world, I mean save as many people as possible from hunger, thirst, illness, repression, and from a lack of everyday needs – the sort of needs that you and I take for granted. 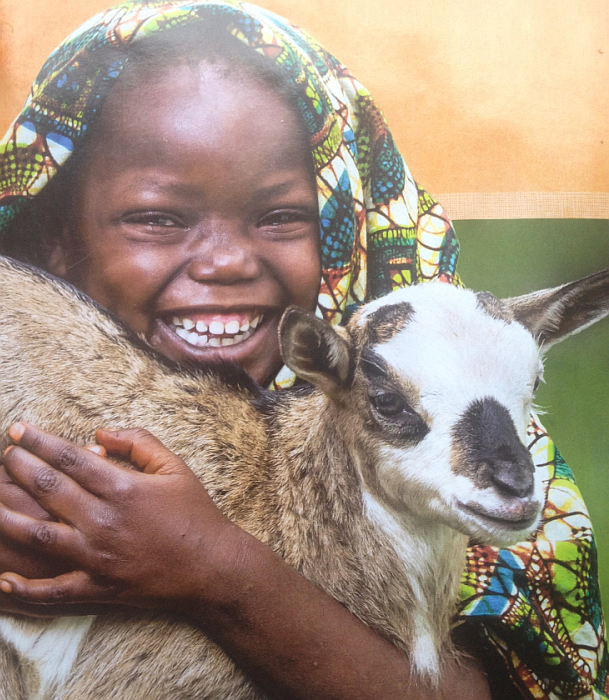 Years ago, World Vision set up something extra wonderful – the World Vision Gift Catalog. Since it began in 1996, the World Vision Gift Catalog has grown in popularity as a gift-giving alternative; more than 844,000 people helped someone through the Catalog in the last year alone. 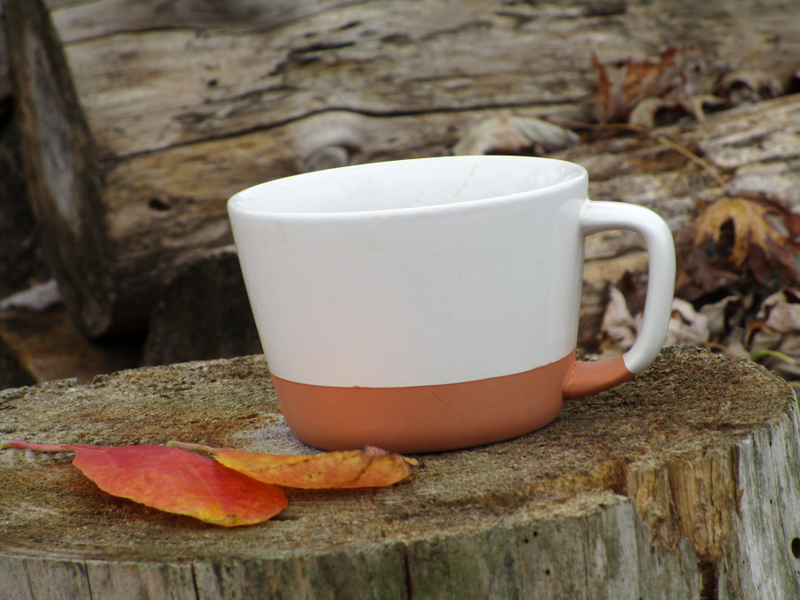 My much loved and much treasured Fair-Trade Coffee Set from the One Cup Project is just one of the gifts available in the gift catalog. 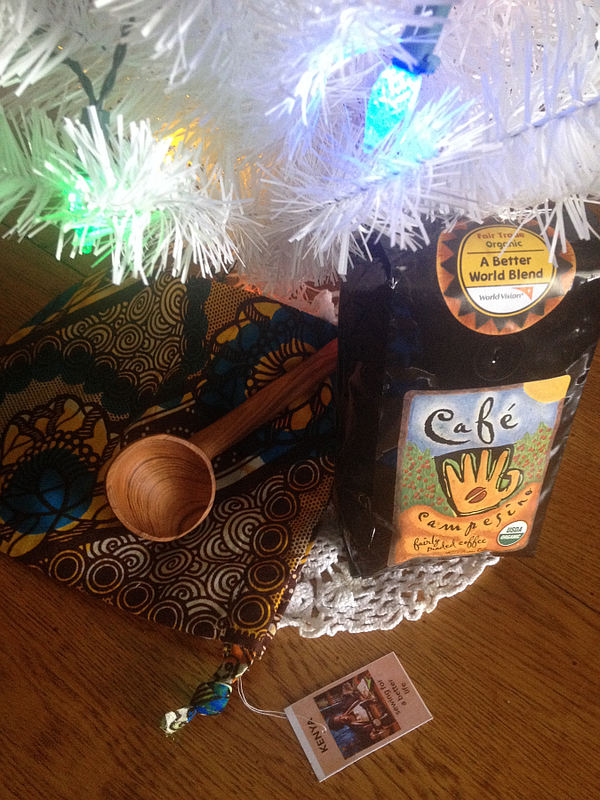 Before I tell you why the Coffee Set is an incredible option and why holding the handmade items brought tears to my eyes, let me tell you a little bit about how the gift catalog works – and how, by buying something extra-special for someone you love, you can touch the life of someone you’ve never met. More than 250 items, ranging in price from $10 to $39,000, are available online and in the print catalog to help improve quality of life for women, children and families in the United States and around the world. When you give where it is needed most, you can receive handcrafted gifts that are perfect for holiday baking or entertaining. When I received the One Cup Fair Trade Coffee Set on my doorstep, I was as excited as a 6 year old on Christmas morning. 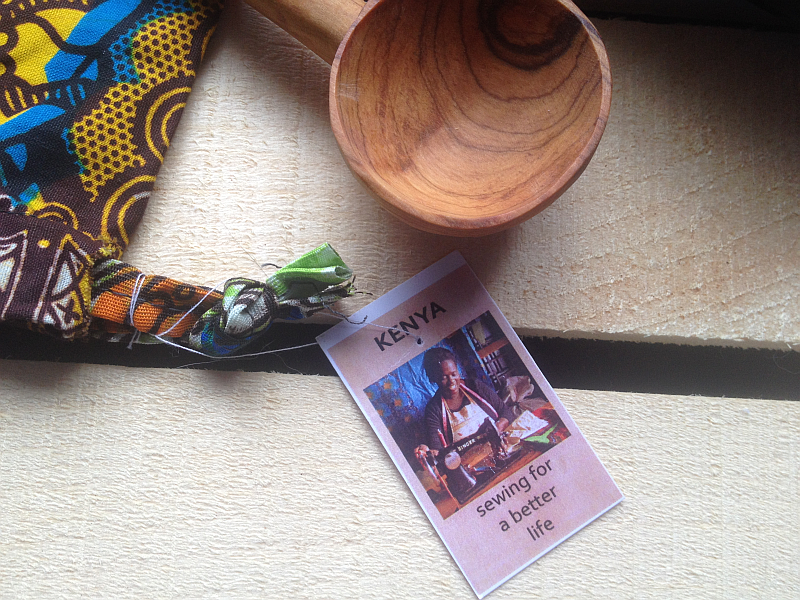 Knowing the story BEHIND One World Vision’s mission, the importance of the Gift Catalog, and the fact that the set would include a handmade wooden scoop and hand-sewn bag (made from African fabric) crafted by beautiful people a world away left me with a lump in my throat. As a writer, I work with words every single day of the year, except for Sundays. Yet, right now I’m at a complete loss for just the right words to describe how it felt to hold this beautiful wooden scoop and colorful, beautiful fabric bag in my hands. I can’t describe the feeling but, know this, I’ll never forget the feeling. As tears came to my eyes, it just reawakened a love for all of God’s people – near and far. It also served as an alarm to awaken something inside of me that had been napping – there are men, women, boys, and girls all over the world who not only have the luxuries you and I take for granted – they don’t have food, shoes, or even clean drinking water. You know the “survival” shows we watch on television – for our entertainment? There are precious people out there who’d look at these shows as though they were “just another day.” In fact, they might even think that these popular “survivors” are kind of soft. Our entertainment. Their reality. How is this even possible? I hope I’m not depressing you. That isn’t my intention. I just wanted to sound an alarm loud enough for as many people to hear as possible. THEN… in turn… I hope you set off you own alarms. If you’re like most people, you’re thinking, “But, what can I do.. I’m just one person?” World Vision and One Cup are making it SIMPLE, EASY, PAINLESS, and DELICIOUS for each one of us to do our part. 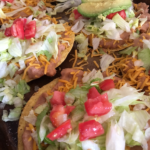 Simply by doing what we routinely do…. buy coffee! Now, let me tell you about this wonderful coffee. I actually put off opening and brewing the coffee for a couple of days. Why? I’m not 100 percent certain, but I think it had something to do with emotions and expectations. I was so EXCITED about One Cup’s mission that I was afraid the coffee wouldn’t live up to the moment. I mean… how could it, right?!?! 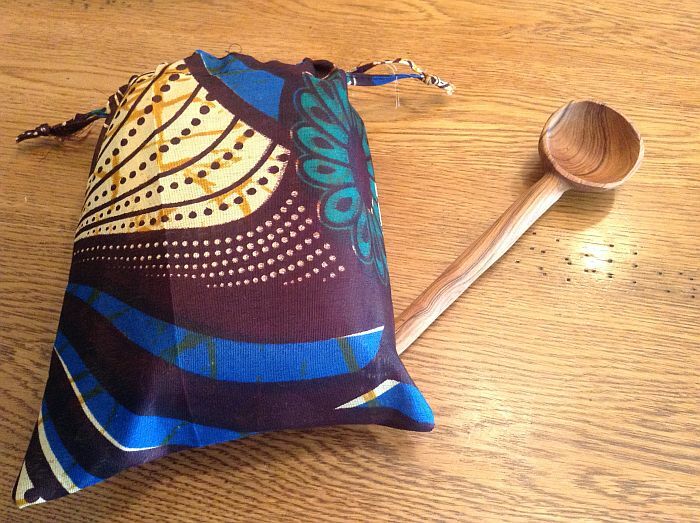 I reasoned that, if one of these things happened, I’d just keep it to myself and focus 110 percent on the mission, the beautiful fabric bag, and the adorable wooden scoop (I do love that bag and scoop!). I guess there’s safety in numbers, because the first time we opened and enjoyed the coffee in our home was when one of our best friends was visiting. He, like my husband and myself, is a huge coffee lover. It seemed like the right time to try out exciting new coffee with three complete coffee addicts in the same kitchen. As the coffee beans were grinding and then brewing, the gorgeous, glorious aroma filled the room. There’s nothing quite like the aroma of great coffee, is there?! We, like all people who take their coffee seriously, buy a wide assortment of coffee beans. We buy a lot (A LOT) of coffee online and I certainly buy my share of Starbucks and Caribou coffee beans. We’ve been known to buy fancy shmancy coffee beans online that cost more than any coffee beans have a right to cost. We don’t do it often, but I’ll confess… our passion for coffee sometimes overtakes our budgeting sensibilities. I say all of that to say this – we know average coffee, good coffee, great coffee, and exceptional coffee. It is my privilege to tell you that this particular coffee qualifies as exceptional. As a coffee pro, I suspected it’d be special when I opened the bag. 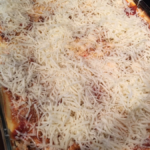 The smell gave it away – I knew it was special. In fact, if we’re being honest – this coffee creates its own category. A category that reaches BEYOND exceptional because it is included in a set that makes a difference…. a VERY REAL difference… in people’s lives. It allows US to reach out and lovingly give a hand to others while offering them hope. I’d never use the fabric bag for anything other than artwork – no way am I taking any chances on getting it dirty or tearing it! I’d also use the scoop as the piece of art that it is. It, along with the beautiful bag are showcased in our dining room – set where I can see them everyday and show them off as often as possible. And, finally, I knew I’d cherish them forever and ever, Amen. Please click through and read more about the beautiful One Up Project. You will be touched by their mission and the coffee lover in you will be excited by the number of fantastic coffees they have available. I hope you’ll pick out a few bags to order today! 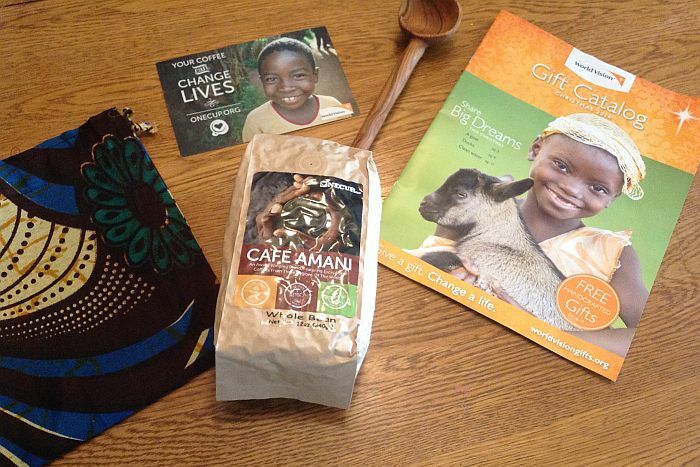 For every $11 bag of coffee you buy, $11 goes to fund living aid in Africa. 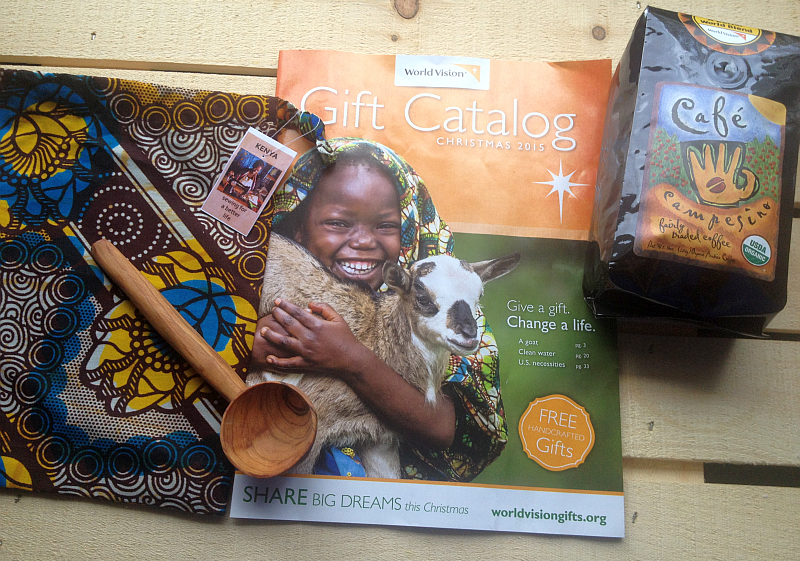 I also hope you’ll read more about the World Vision Gift Catalog. 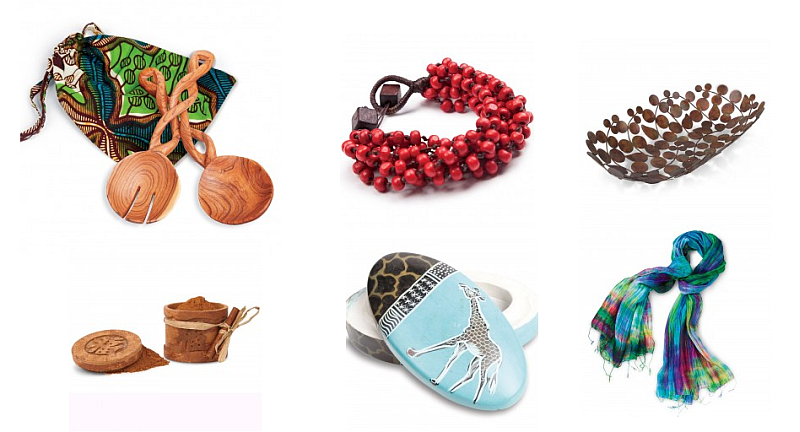 Below are just a FEW of the wonderful gifts in the catalog. 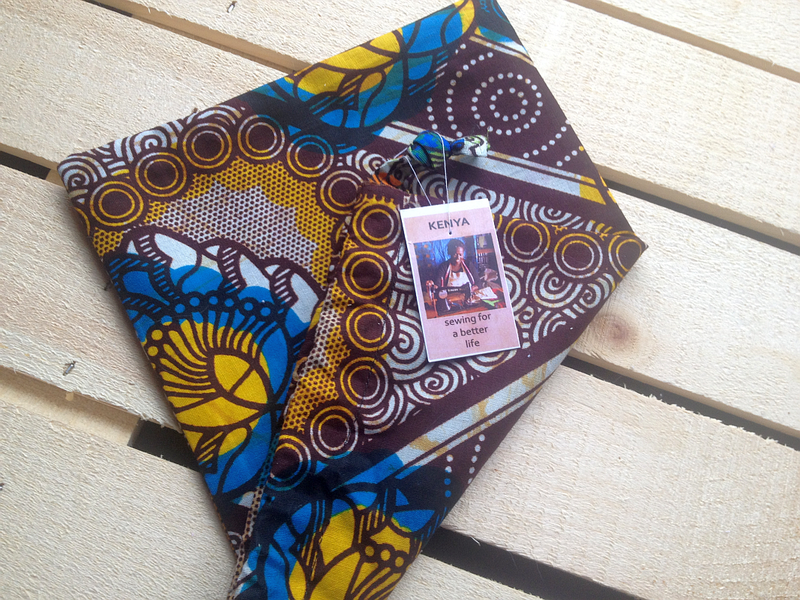 There are a LOT more – including a gorgeous scarf I have my eye on.. both eyes, in fact! Be sure to connect with World Vision on their Facebook page at/WorldVision and on Twitter at @WorldVisionNews. 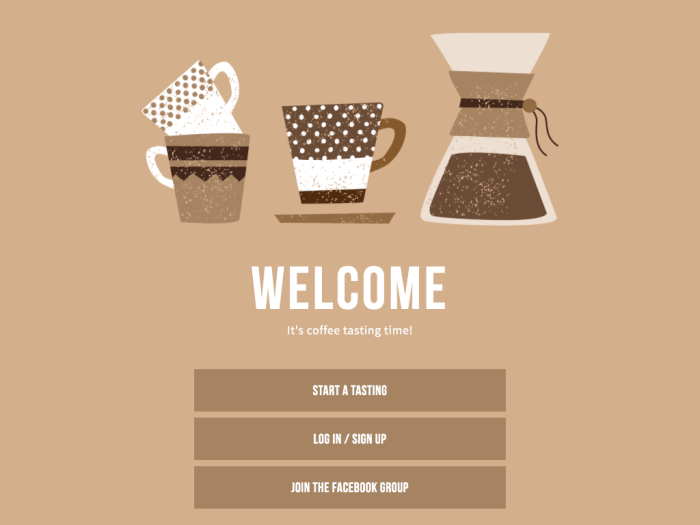 You can connect with One Cup Project on Twitter at @OneCupProject. Can you imagine all the lives that could be touched and saved if we ALL roll up our sleeves and did our part? 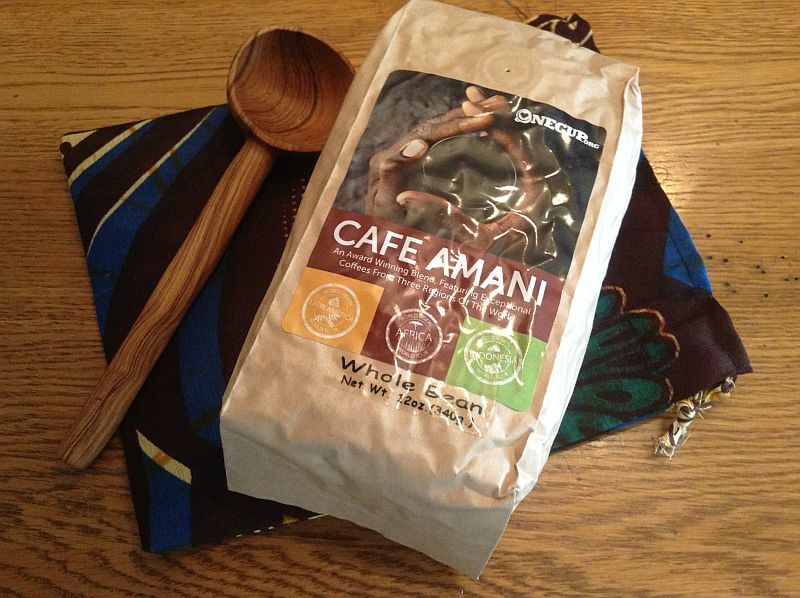 You will treasure your fabric bag and wooden scoop as much as I do and the exotic, WONDERFUL coffee will blow you away! I was, as I often am, on Amazon earlier. I’m one of those people who goes ALL OUT when it comes to decorating for holidays, special days, and seasons. For some reason, I don’t have an awful lot of St. Patrick’s Day decorations and Amazon was trying to help me sort that out. Amazon’s so good to me. One of the first things that made me say, “How can I NOT order that? !” was the Grasslands Road Celtic 10-Ounce “Himself” Irish Coffee Mug, Gift Boxed (above). Naturally, I had to find out if there was a “Herself” mug and… BOOM!… there surely is (the Grasslands Road Celtic 10-Ounce “Herself” Irish Coffee Mug, Gift Boxed is pictured below). I told you Amazon was good to me. Click through either link or image for more information.